Amazon launched its first convenience store in Seattle, Wash., last week without a single cashier throughout the store. A few employees drift around the aisles, restocking shelves and directing customers. Amazon has tried to automate as much of the process of grocery shopping as reasonably possible, though, The Associated Press reports. Seattleites lined up outside the store for the grand opening, eager to experience Amazon Go and its line-less checkout. A customer entering the store is confronted by a row of security gates. 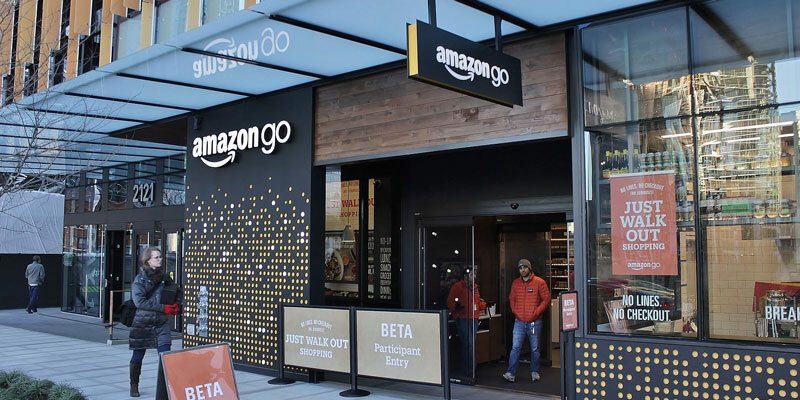 Customers must download the Amazon Go app and flash their unique code on a scanner before the gate will open, according to The Seattle Times. Instead of pushing carts or carrying baskets, shoppers carry around Amazon Go shopping bags that they will eventually walk out with. The 1,800 square foot store carries a mix of products popular at most convenience stores — chips, soda, candy, etc. — and some items found most often in Whole Foods stores, which Amazon owns. Cameras track people as they walk through the store picking items off the shelves. Scanners are able to tell what item is what and keep track, adding it to the shoppers “basket” or taking it out as products are taken off and put back on the shelves. Checking out is simply a matter of walking back through the gates with the items grabbed and without sitting in a checkout line. A receipt is emailed and sent through the Amazon Go app within minutes of the customer leaving. The store and its technology have been in a testing mode for about a year, used exclusively by Amazon employees.